Waaaay back when, I stitched this little number for my bf. A couple of weeks ago I came up with the idea to do a stitchers' version of it, minus the binary because frankly, I didn't want to stitch all those ones and zeros again. I'll be adding the pattern in the next few days, depending on my level of laziness. 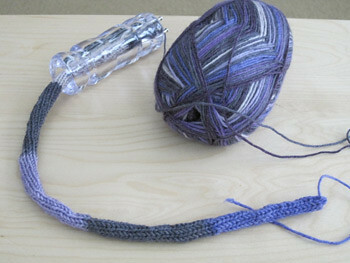 I also started a new crafty thing- spool knitting. I used to do it when I was a kid and somewhere in my mom's garage is my original stuff. I decided to start up again to give myself something relatively simple to do while watching tennis or golf over the summer. Particularly when I'm not stitching something. It worked nicely while I watched the final round of the US Open on Sunday.